There hasn’t been much talk about the upcoming N.W.A. 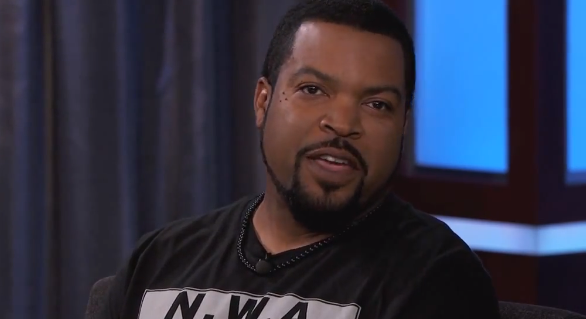 movie Straight Outta Compton, but that all changed tonight as Ice Cube paid a visit to Jimmy Kimmel Live! The rapper/actor was asked about the project directed by F. Gary Gray and co-produced by Dr. Dre, who would be playing some of the characters and he revealed that his son would be playing his part in the film. According to Cube, his son was perfect for the part and dug deep into his arsenal of stories to get ready for the role. His time on the set was a trip back into time with everyone in the crew there reliving old memories, and he compared the experience to Back To The Future. Jimmy Kimmel also had Cube say some phrases he read in anger, in light of their previous interview when the segment caught fire on the Internet.